73 crop budgets for 15 crops, available in PDF and editable Excel formats so they can be customized to your operation. Lower fuel prices among factors leading to decreases. 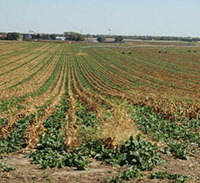 See article for per bushel breakeven point for all the cropping systems. What can We Expect from Forage Cover Crops? Agronomy & Horticulture Seminar Schedule: Fridays this Spring. Nebraska Extension Plant Pathologist Tamra Jackson-Ziems will be discussing corn diseases at the Jan. 22 session.